A new and unexpected source of radioactive material left over from the 2011 Fukushima nuclear disaster has been found up to 60 miles away along coastlines near the beleaguered plant. The discovery shows that damaged nuclear reactors are capable of spreading radiation far from the meltdown site, and in some surprising ways. Indeed, approximately half of the 440 operational nuclear reactors in the world are situated on a coastline. After the 2011 accident, scientists monitored leaking radiation as it entered into the atmosphere or trickled into rivers, but the Fukushima plant—damaged by a devastating earthquake and tsunami—is the first major incident to happen along such a large water body, namely the Pacific Ocean. This new PNAS study is now the first to consider subterranean pathways for the storage and release of radioactive contaminants following a nuclear disaster. The researchers sampled eight beaches between 2013 and 2016, all within 60 miles of the plant. They plunged seven-foot-long tubes into the sand, pulling up sand and groundwater samples for analysis. The cesium levels in the brackish groundwater—a combination of fresh water and salt water—was ten times higher than what’s currently being detected in the waters swirling around Fukushima’s harbor, while cesium was tracked in the sand up to a depth of three feet. 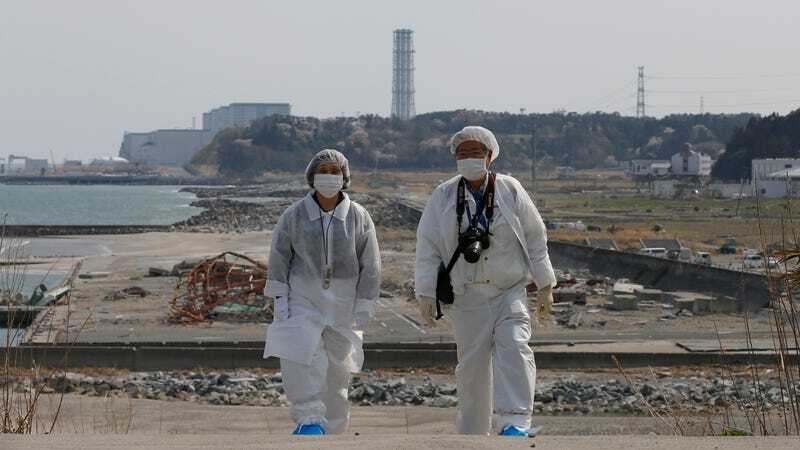 Sanial and Nagao suspect that high levels of radioactive cesium-137 were released into the environment following the 2011 disaster, and then transported along the coast by ocean currents. In the days and weeks following the meltdown, waves and tides delivered this radioactive waste back onto the surrounding coastal beaches. The cesium attached itself to the surfaces of the sand grains, and some managed to trickle down to the groundwater below. But here’s the thing—cesium loses its “stickiness” when it’s exposed to salt water. So with each passing wave and tide, the cesium is slowly getting released back into the ocean. The amount of radioactive waste detected by the researchers in the adjoining water is roughly equal to the amounts drifting in from the other two known sources: ongoing releases and runoff from the plant itself, and overflow from rivers that carry cesium from the fallout on land. Importantly, all three of these sources are releasing radiation at rates thousands of times smaller than what was experienced immediately after the 2011 disaster. Cesium has long half-life, so “only time will slowly remove the cesium from the sands as it naturally decays away and is washed out by seawater,” said Sanial in a release. As noted, the amount of radioactive cesium observed doesn’t pose a public health risk, but this latest study indicates that radioactive material can be transported far from accident sites. At the same time, the discovery adds another layer of complexity when deciding how to best manage a plant—and where to put it.